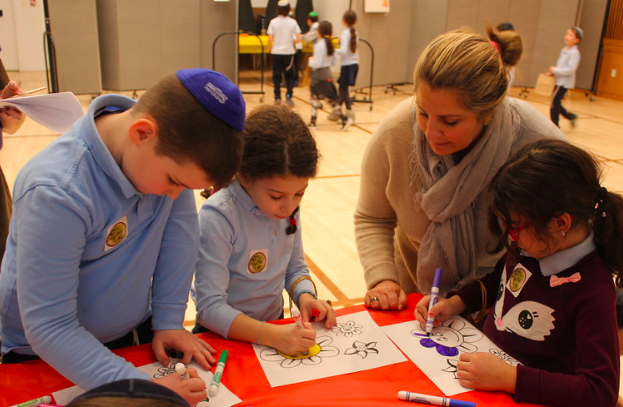 Second grade classes participated in an interactive and engaging Tu B'Shevat carnival led by the Judaic Studies teachers. Divided into groups according to the "shivat haminim," (seven species) the students rotated from one station to the next, learning about the various aspects of the "festival of trees." The students enjoyed decorating lemons with cloves for "besamim," to be used during Havdallah, making their own fresh-squeezed orange juice, decorating flower pots and planting seeds, experimenting with paper flowers in water, and playing Tu B'Shevat games! Each student left the carnival with a bag full of goodies containing the crafts and prizes that they had collected at each station. The students had so much fun and learned many new things. Students were overheard exclaiming: "This was the best day ever!" A truly memorable and enjoyable Tu B'Shevat experience for all!